The Yorkshire marathon takes place in October every year, and Stuart and I have run the event for the last 2 years, using the opportunity to make a bit of a holiday at the same time. This year Stuart opted for the 10 miler, while I could not resist another go at the marathon, having enjoyed it so much previously. The event is very popular, selling out each year and is exceptionally well organised with a ‘park and run’ which goes like clockwork from the local airfield to the start. With accommodation generally at a premium in the centre of York, it’s better to stay outside the city and take advantage of this service. Baggage storage is quick and the toilet queues are eerily quiet in comparison to London and Brighton! We arrived at the start early, but we passed the time drinking tea and chatting to a fellow runner from Sussex who was hoping to better his Brighton time. (He was focussing on a sub 3 while I was still deliberating what colour hat to wear!) with my start being 45 minutes ahead of Stuart’s tea and toilets done I made my way to the start where the pens are well organised in time zones. The countdown was done and we were off, cheered across the line by local sporting legend Dickie Bird. 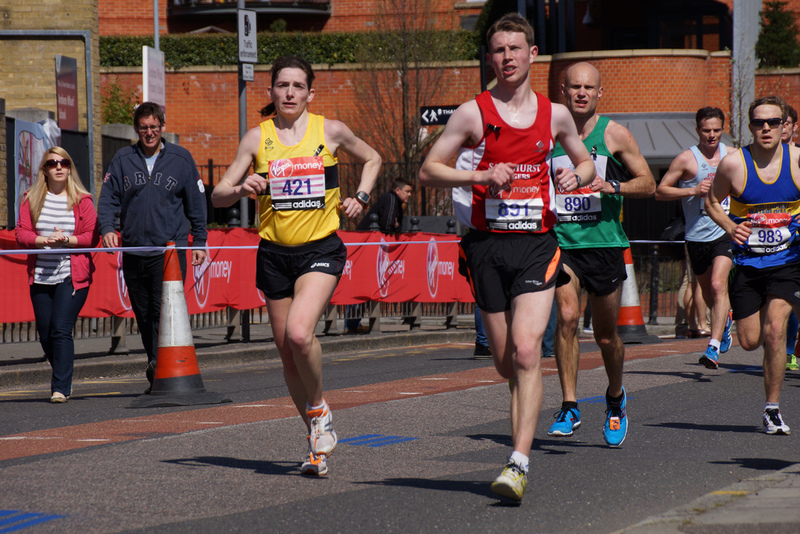 Both the marathon and 10 miler start at the University of York’s Heslington campus, taking you on a lovely downhill through the historic city centre, passing through the medieval walls out of the city cheered on by the crowds. There are plentiful pockets of great support along the way, punctuated by some peaceful periods where you can enjoy the scenery. Water stations are plentiful, and high fives in abundance from the local clergy to brownies and cubs, and music and bongo playing to entertain. The route travels through picturesque country roads and villages on a gently undulating course before returning back to the University…note that the gentle downhill of the start becomes a monstrous hill to the finish! I started off with the 3.30 pacer, but a look at the watch at mile 2 showed he had gone off at a rather ambitious 7.30 pace so I eased back and ran my own race, thoroughly enjoying every minute, in perfect running conditions, mild and sunny. A tummy ache at mile 22 meant my last few miles weren’t as fast as I hoped, however still managing to sneak under 3.30 I was pleased with the result and still smiling as I collected my medal…even after all the marathons I have run I still like a nice medal! The goody bag contains a nice t-shirt and some actual goodies in the form of chocolate and fruit and nuts…so something for everyone! We enjoyed a celebratory free beer at the end (though sadly it was also alcohol free!) before hopping back on the park and run bus back to relax and look forward to a well-earned curry!